The Merax Finiss 21 Speed is a 700C Road Bike Racing Bicycle with Shimano shifter and derailleur is a 28 pound racing bicycle perfect for beginners, amateurs, and those looking to get serious about road biking and racing. The strong and lightweight frame can carry riders up to 330 pounds and comes in three different color schemes and three different sizes. You can choose from three attractive two-toned designs, including green and black, red and white, as well as yellow and grey. Each design is very attractive, unisex, and perfect for men and women looking for a pop of color as they take to the roads with this unique Shimano racing bike. With its aerodynamic frame and wheels made for long distance riding and a sleek look that will cut through the air like a pro, you can begin your journey to serious riding or simply a casual ride around the neighborhood. This racing bike comes in three sizes that are suitable for both men and women: 50cm, 54cm, and 58cm. This measurement refers to the distance from the center of the bottom bracket to the top of the seat tube, where the seat clamp is located. What is important to take into consideration is that the seat can be shortened and lengthened, so this measurement can be somewhat meaningless unless you size the bike based on the top tube length—this will measure the distance the rider has to stretch to reach the handlebars and can no longer be adjusted by seat height. Make sure to read the sizing charts carefully with respect to your height and reach. The design of the Merax Finiss includes a 21 Speed 700C Aluminum frame, which is lightweight but sturdy—perfect for the road and for a smooth, aerodynamic ride. The quick-release front wheels and aluminum kickstand pair with a Shimano shifter and Shimao derailleur to offer easy and smooth gear shifting as needed. 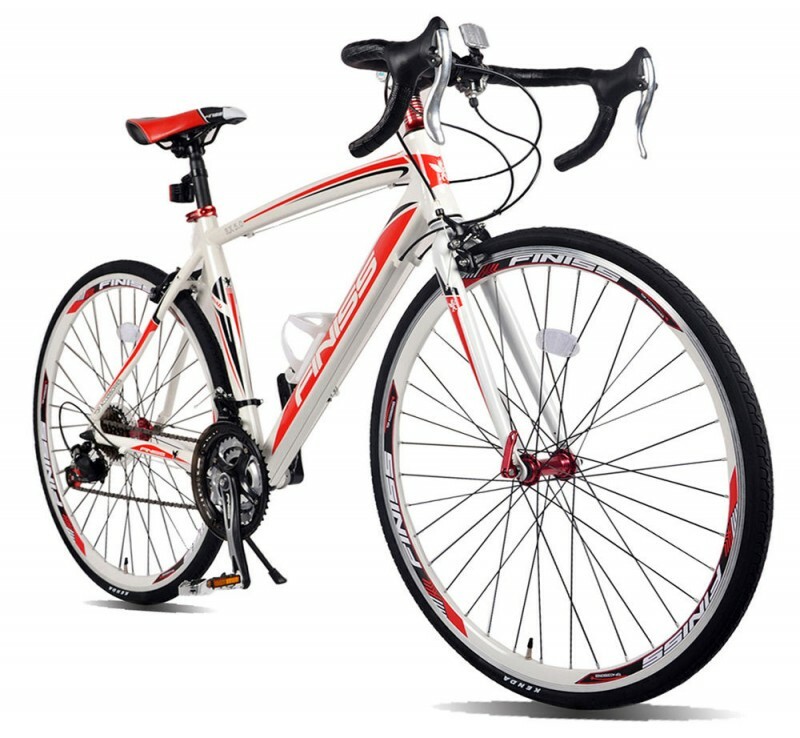 The best aspects of this bike pertain to its functionality in respects to its design. Designed and intended for road use (specifically, racing), this racing cycle is aerodynamic, light, and sturdy. Its Kendra tires sit on Aluminum A5 rims, which complement the sleek design of the frame. With Shimano gear and aluminum caliper brakes, this racing bike is excellent for anyone who is seeking to purchase a racing bike for an economical price. Under $300, this bike performs well for its quality. Racing and road bikes can run into the thousands of dollars; for its caliber and price, any beginner or rider who wants the option of road racing will find this to be an excellent make and model to start with. Another aspect of this model that is excellent, is its aerodynamic frame. Unlike typical road bikes, which have cylindrical frames, the Merax Finiss has a flattened frame that is aerodynamic in nature and intended to shave off seconds while riding. This racing bicycle does not arrive assembled or tuned. Unless you are an experienced rider, it is recommended that you take the bike to a professional or for assembly and tuning in order to assemble for the best fit for you. This racing road bike is not for advanced or professional riding per se. It is excellent for pro practicing, but it is best for novice or casual day to day racing. As expected for an entry level bicycle, the components are not of the highest quality. There have been reports from users of this model regarding quality issues with the derailleur and chain grinding, as well as the comfort of the seat. The chain itself is of delicate quality and may break. I would recommend purchasing this bike if you are just starting out and need an entry level bicycle to become accustomed to a racing road bike’s style and function. If looking for superior quality components, another brand or a model with superior materials may be a better choice for you. However, it will be a bit more expensive and likely exceed $300. In addition, the weight limit is 330 pounds, however, it is recommended by the manufacturer, that for long term use, a 220 pound weight limit should be adhered to. This is a 110 pound difference between the advertised weight limit and the recommended weight limit that is more realistic to maintain quality and function. The highlight of this racing road bike is both its aesthetic and aerodynamic design. The available color schemes are great for men and women of any age, and provide attractive options to choose from. These bikes look great on the road and are stylish. The aerodynamic design is racing-specific and offers an additional aesthetic for riders. This racing road bike’s functionality, as determined by the technical specifications as well as reviews from users is overall positive. If one understands that this is an entry level racing bike and that it is not going to be of similar quality to more advanced or professional bicycles, then you will have a positive experience. If you are a new rider expecting superior quality and durability of components, you must understand that advanced and professional road bikes, especially racing bikes, run into the thousands of dollars. For its intended usage as an entry level racing road bike, this Merax Finiss 21 Speed functions well in all areas. 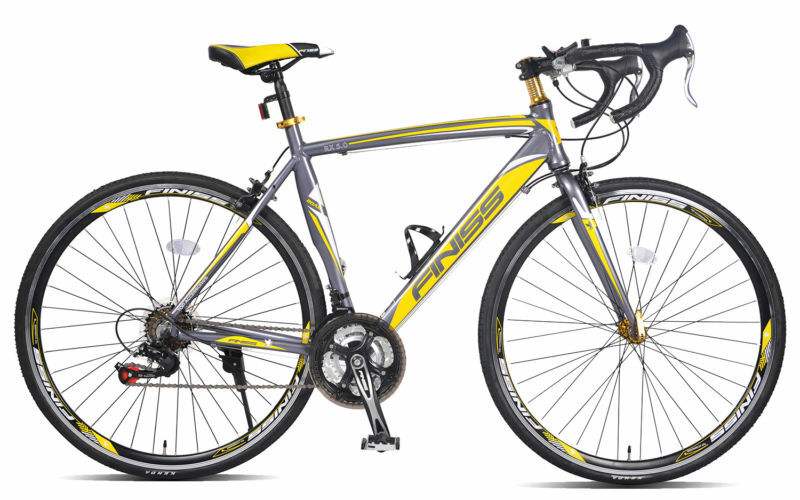 The price of the Merax Finiss 21 Speed 700C Road Bike is an economical $259.99 to $299.99, depending on the size purchased. Sizes come in 50cm, 54cm, and 58cm; perfect for both men and women. You can purchase this Racing Bicycle on Amazon. My overall impression of this racing bike is somewhat mixed. While it functions well for its quality, caliber, and price, the lower quality of its components (despite being appropriate for the cost), still has a few issues that may be a problem for some riders. If brought to a professional or experienced rider for assembly and tuning for the rider’s specific height and size, and treated well, this bike will, however, last a long time on the road. If the rider is over 220 pounds, they may wish to choose another bike. While the weight capacity is 330 pounds, it is recommended that for longevity, a 220 pound limit be enforced. Overall, this bike emotes mixed impressions—but overall, for the price, intended function, design, and functionality for its caliber of racing bike, the Merax Finiss 21 Speed is recommended for the entry level rider. 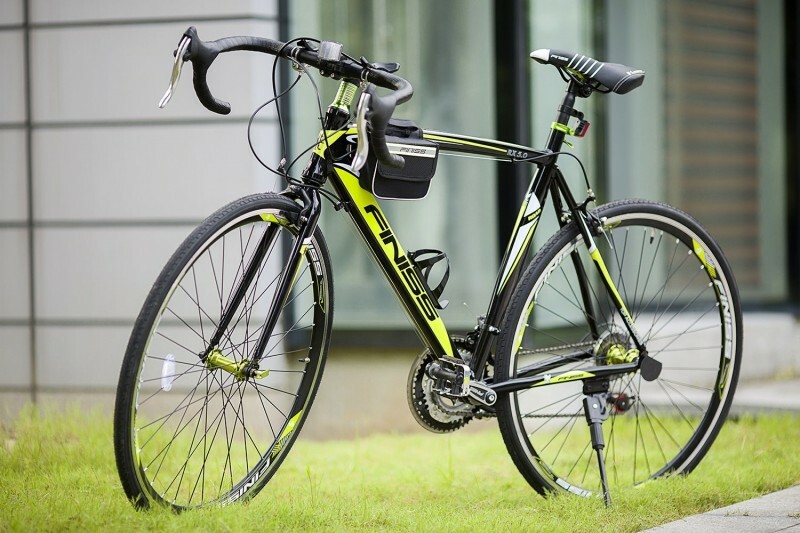 The Merax Finiss 21 Speed is recommended as an entry level road bike, but with the complaints that have been rather consistent regarding inferior quality of materials used in making this model, the functionality and quality ratings took a hit. These negative aspects cannot be ignored when considering the purchase of this model. This is why the Merax Finiss is a fair entry level road bike, but for those seeking higher quality of materials and craftsmanship, you can certainly find a better road bike for a similar price than this model.